One of the Europe`s finest complexes laid in the 17th century by St. Lubomirski. Then Lazienki was a royal zoo that King Stanislaw August Poniatowski turned into a garden in the 18th century giving it its present Classicist shape. During almoust 30 years, on the area of about 80 hectares, the summer residence of the monarch was built , the park designed and several buildings raised. During this period (1772-1793) Dominic Merlini remodeled the old bathing pavilon from the 17 th century and built the Palace on the Island, a splendid Neoclassical Palace to Tylman of Gameren design. the painting Gallery, the Chapel and the Dining Room, memorable for the Thursday lunches organized by the King. On the second floor, there are King`s Apartments: a small gallery of paintings, a room with a balcony, a cabinet, a sleeping room, a dressing room and an officers` room. 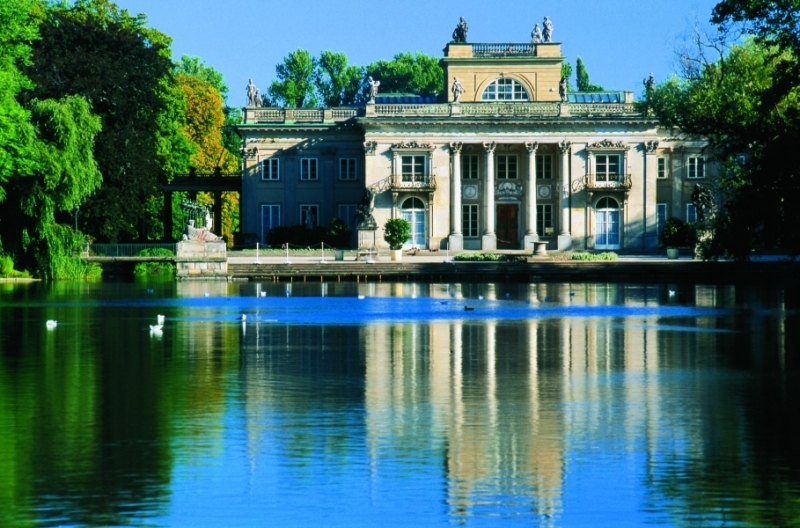 During of Stanislaw August Poniatoreign, the Amphitheatre work of Jan Chrystian Kamstezer from 1790-1793 was built also: the Large Orangery with the theatre of the royal court, the White Cottage and the Myslewicki Palace. The Museum of Hunting and Equitation lies next to this palace.